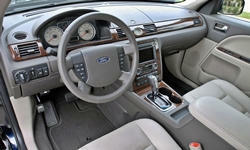 Why the 2008 Ford Taurus? Three adults can sit in the back and there knees will not touch the front seats nor will there heads touch the ceiling. The seats are very comfortable. Noise is very low and the car has two vents blowing air or heat. This car has a huge trunk! The trunk opening could be a little bigger, but the trunk itself his huge. The back seats lay down to make even larger. This trunk is significantly larger than the 2005 Chevy Impala. The car has plenty of power. We have no problem with the family and all our luggage for a week getting over mountains. The car does not struggle to maintain speed. It has no problem passing. The engine is very quiet and smooth. 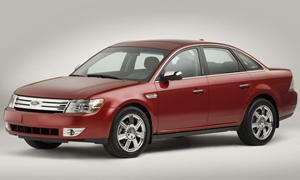 Why Not the 2008 Ford Taurus? The warranty is the old Ford standard warranty, except the drive train is longer. For a car with so little recommended maintenance under 100K mile the warranty should compare to Hyundai or better. The car has excessive body role while cornering. My Jeep Cherokee has less role than his car. We bought this car from Classic Ford in Smithfield NC. The finance office was very unorganized and we had to go back 4 times to get the paperwork right. They are less than forthright about what you are approved for on financing.